Easter Sunrise Service, Castle Island, Boston. 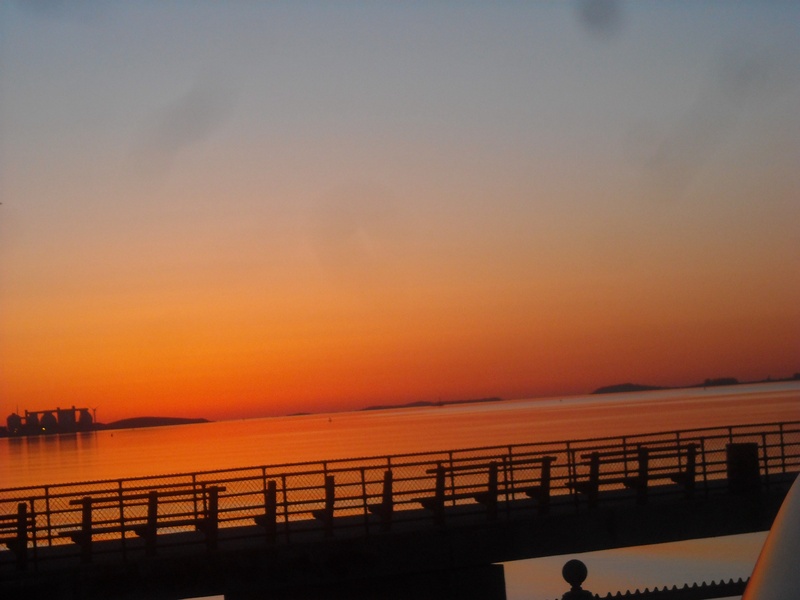 Easter sunrise service on Castle Island in South Boston …Wow! The view to the east is amazing. I am not going to try to describe it, but it is worth getting up early for … At least once! I had been providing the sound system for the event for a couple of years and had really enjoyed setting up the sound gear in the dark and watching the new day arrive. The airplanes are not landing at Logan airport across the harbor at 4:00 in the morning and you can actually hear the harbor, the sound of the waves hitting the shore, some large ships going by … Add the flash of light from Boston Light and the slightest hint of change out on the horizon … It is very nice! This year I had asked my contact with the Castle Island Association if I could try powering the event with one of my solar powered battery rigs and he said yes! Normally … By the time most of the people arrive for the Church service the generator is already running with its constant drone covering up everything but the “red eye” flights coming in and the occasional overhead sea gull. This year the first sound breaking the harbor “soundtrack” was the “Good Morning” from the priest celebrating the Mass … I’m sorry if it startled anyone! The system ran for 2.5 hours and used .35 kWh of power … a tiny amount by any standard. Basically the “idling” current draw from having the four wireless microphones, mix rack and amplifier on … With no background noise to compete with, the overall sound level did not need much power to cover the audience standing an an area almost the size of a football field. The small “solar system” I brought to power the event was about the same size and weight as the generator that I helped off load from the park rangers utility tractor in previous years. Something else to think about … Eventually! The battery systems had worked wonderfully at powering the events so far. But I had unknowingly been getting a little help from good old fashioned “dumb luck”. If this project was to get out of the tinkering stage I wanted to do it without needing that help. Adding the battery meters was going to provide some very useful information, adding fuses was going to keep everything and everyone safe … and spending a little “quality time” with my coffee pot and calculator was going to get the systems performing as well as they could … For a long long time! To find out how long you will have to check back later … Hopefully much later! In working with 12 volt DC power it is very important to size everything for what you are trying to do … In my case … Powering all the equipment needed for an outdoor concert. To do that I needed to use the largest, shortest wires possible. Using a voltage drop calculator like the one found in “rapidtables.com” you can see what size wire you will need to use. For this part of the project I used short (18″) #2 cables to go from each of the batteries to a pair of insulated buss bars, and total of about 8′ of #2/0 cable to get from the buss bars, through a circuit breaker, fuse and shunt to the inverter and back again. If I’m doing my math correctly I am only losing .1463 volts (1.17%) to voltage drop with a 200 amp, 12.5 volt DC load … A little more power than what you could get from a standard household 20 amp circuit. It sounds like an awfully small amount of loss to get excited about, until you realize almost everything in a 12 volt system will shut down when the voltage drops below 10.5 volts. Losing .1463 volts from 12 volts does not seem like much … But if you only get to “play” with the 2.4 volts between 12.9 volts (a full battery “at rest”) and the 10.5 volt “shut off point” … Losing that .1463 volts means I would lose between 5 and 8% of my total power at full current … And if I wanted to keep the batteries alive as long as possible I do not want to discharge them fully … I could be losing over 10% of my power … to wire! I am hoping to give you a little “photo” tour of how I wired one of the systems in my next post. This entry was posted in Outdoor concerts, Solar power, sound system, Uncategorized and tagged Boston harbor, Easter sunrise service, Portable power, Solar power on September 28, 2014 by zekibeejr. In the mean time … The show must go on … The rewiring project was going to have to wait. The South Boston St. Patricks Day Parade … Where being Irish is not really required! I got a call from Mike Majorowski wondering if my battery system would be able to power a float for his band in the parade. To see if it could be done I set him up with a couple of “Kill-A-Watt meters to use at his next gig to see how much power they would need … While I started to worry about the weather. Rumor has it that batteries do not like the cold! I explained my “concerns” to Mike and we decided to try the parade using my larger system … At the smaller system’s price. We had a beautiful sunny day for the parade … If you don’t mind a little cold wind … We started sound check at 10:00 am at 28 degrees And got all the way up to a “balmy” 37 degrees somewhere along the parade route! Five hours of run time, 1.83 kWh of power used … We even got a nice “Cool!” From the Boston Police Truck team inspecting all the floats when they asked where we were getting our power from … apparently we did not need a special permit for using a generator on the float … Cool indeed! At the end of the day the inverter battery meters still showed 90 – 100% full … It would have been nice to have the new meters installed … The parts had arrived … the extra time needed to install them was still on back order! It was my first event moving the battery boxes around by myself and one thing was certain … Those battery boxes are heavy … Very heavy! 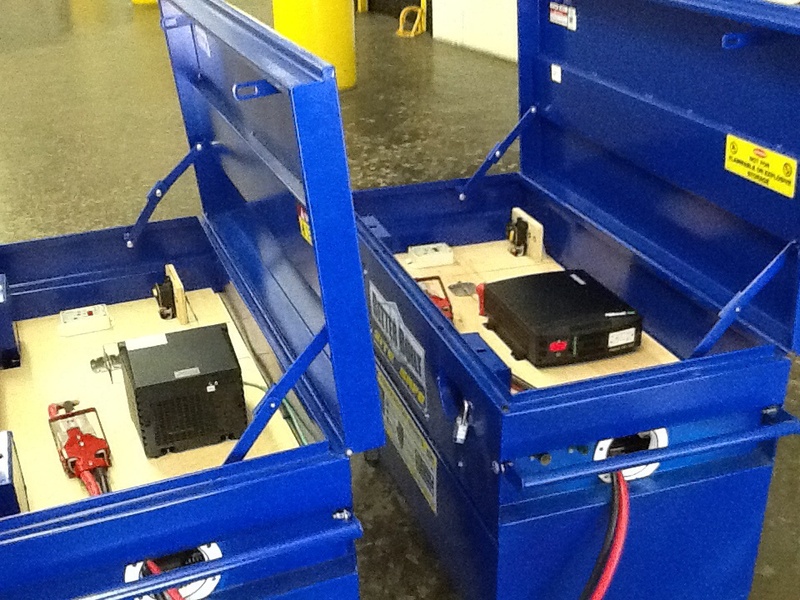 The larger system consists of a pair of “Site Safe” tool boxes with each box weighing in at about 500 pounds! … So “portable” is a relative term! Moving them from the truck to a loading dock, or in this case … To the back of the “roll off” tow truck that was used for the float was pretty easy … Pushing them up the ramp to my truck? … Not so much! My to do list keeps growing! This entry was posted in Outdoor concerts, Parades, Solar power, sound system, Uncategorized and tagged parade float, Portable power, Solar power on September 12, 2014 by zekibeejr. Oh well … It turns out almost everything I did on my first attempt at going solar was wrong. Wrong wire sizes, wrong lengths, wrong assumptions about how a bank of batteries should be wired … All of which made for a lot of possible failures. Overestimating how much power I would actually be using … And more than a little good luck keeping any of those failures from happening! The first “order of business” was to get a real metering system installed … It was time to find out what was really going on with the batteries. I needed a “gas gauge” I could trust. The Trimetric meters from Bogart Engineering are highly recommended by a lot of folks. … I decided to try the 2025 RV model for the project. The 2025 is a very neat device that keeps track of the power in Amps going in to and out of the batteries … A quick look will tell you the voltage. Press a button and you will see how much power is going into or out of the batteries. Press the button again and the meter will tell you the batteries are 87% full (… Or 18% full … It might be time to start thinking about worrying … Soon!). In any case … More information than I could have hoped for! The folks from Bogart Engineering have designed the meters to do a lot more … But those three things were going to answer a lot of my questions … And keep me out of trouble … For a little while at least! Adding the meters to my “rigs” was going to take some rewiring … and some math … More on that later. Since I was going to have to get in and do some rewiring to install the meters it made sense to go in and fix as many of my wiring mistakes as possible … My good luck was only going to get me so far! If you’ve been following along since the beginning you may remember my first big battery powered show having some yellow “warning” LEDs flashing on one of the inverters. The band had not gotten any louder … But something had changed … It took over a year to figure out what had happened … the power in the batteries was not getting to the inverter. Resistance was “robbing” the system of power. It was a good thing I pulled the amplifier from one inverter and plugged it into the other inverter when I did … Or that show might have been the last! My common sense approach was not helping at all … Luck … On the other hand … Was! When using batteries to power something you do not want to waste anything. Leaving a 60 watt light bulb on overnight will “eat up” a lot of your battery reserve. It can be done … You just need more batteries … And solar panels to make it happen. A little common sense would tell you … If you do not need it … Turn it off! Common sense probably won’t tell you how much power will be wasted by using the wrong wire. Too small or too long of a wire could waste as much power as that 60 watt light bulb. When using DC power a good “rule of thumb” is always use the largest, shortest wire you can. So … I bought a bunch of larger wire to replace the stuff I had started the project with, ordered some meters, shunts, heavy duty buss bars, fuse blocks, fuses, lugs, heat shrink tubing … and my new favorite tool … A hand held crimper capable of hand crimping up to # 4/0 cable! I wanted my systems to perform as well as they could … The solar powered equivalent of a finely tuned sports car as it were. This entry was posted in Outdoor concerts, Solar power, sound system, Uncategorized and tagged battery meter, Off grid, Portable power, solar on September 5, 2014 by zekibeejr.